Sapphire Rooms is a gem of an online casino located in the UK and licensed by the Gibraltar and UK government. 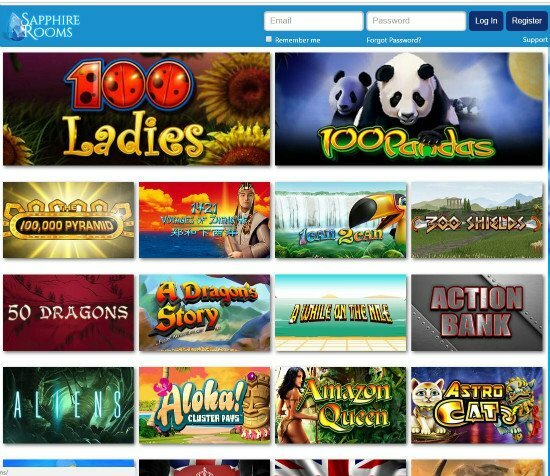 At Sapphire Rooms Casino you will enjoy a top class online slot experience while mobile gamers can enjoy smooth and seamless gameplay while on the move. This simple casino cuts straight to the chase, offering a minimalist approach to online gambling by concentrating on quality over quality. That's not to say the games library is limited. In fact, this casino offers a wealth of popular titles from some of the leading software developers in the world. What the casino does is focus on video slots and not much else. In this way, the casino can work towards creating the best slot experience you can find on the web without being distracted by additional frills. Sapphire Rooms was developed by iGaming stalwart Nektan, a company based in Gibraltar and known for introducing some of the most popular as well as up-and-coming online casinos to the market. Nektan has an impressive eight mobile casino under its wing, and lends its software to big shot online gambling platforms like William Hill and LeoVegas. 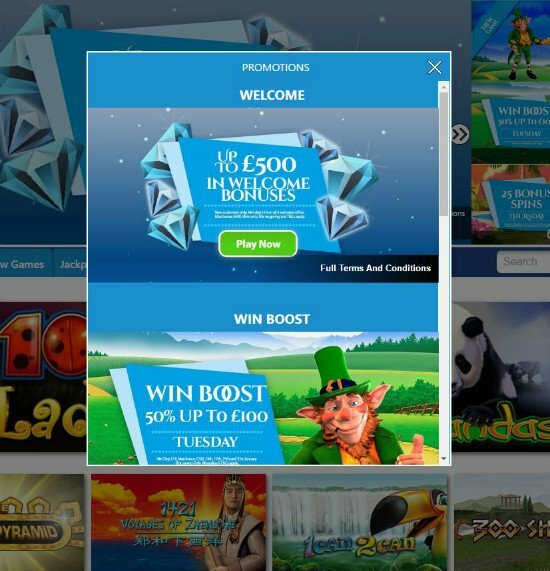 While Nektan is the casino's primary software provider, featuring classic titles like Foxin Wins and Merlin's Millions, a range of other software providers are also featured for a broader range of gambling opportunities from which to choose. In terms of safety and security, Sapphire Rooms makes use of SSL encryption technology to safeguard all sensitive information and financial transactions. In addition, the casino is routinely audited for fairness by NMi and independent agency. Sapphire Rooms online casino is essentially a mobile casino that works well on your desktop computer as well. Things are made convenient by offering instant play opportunities, making it unnecessary to download any casino software. You can quickly and easily access the casino directly from your web browser and start playing as soon as you have registered an account, which takes a few minutes. The casino's mobile offering is as impressive as the desktop casino, boasting a full line-up of mobile games developed by Nektan, as well as leading software providers like NextGen, NetEnt and NYX Interactive. The mobile casino is fully optimised and compatible with most Android and iOS mobile devices. When it comes to the games lobby, it was already mentioned that the casino is strictly focused on online slots, and you will find a host of popular titles and brand new games populating the site. The lobby is divided into several categories for easy navigation, including Player Fav's, New Games, Jackpots, Exclusive and All Games. The selection of games continues to grow on a monthly basis. You will find all your favorites at Sapphire Rooms game section and may even come across some new titles that are worth checking out. Some of the featured slot games include Starburst, Twin Spin, Gonzo's Quest, Wish Upon a Star, Astro Cats, Pixies of the Forest and Fiesta. Despite being an online slots hub, Sapphire Rooms does acknowledge those players who seek some table game experiences, and you will find a small selection of these games to satisfy your needs, including the all-time classics like Roulette and Blackjack. Video poker, specialty games and live casinos fans, however, will have to look elsewhere for some stimulation. New players are rewarded the minute they arrive at the casino in the form of a great £5 no deposit bonus. This free money will be credited to your account the minute you sign up. And that's just the beginning of the special offers available at Sapphire Rooms. 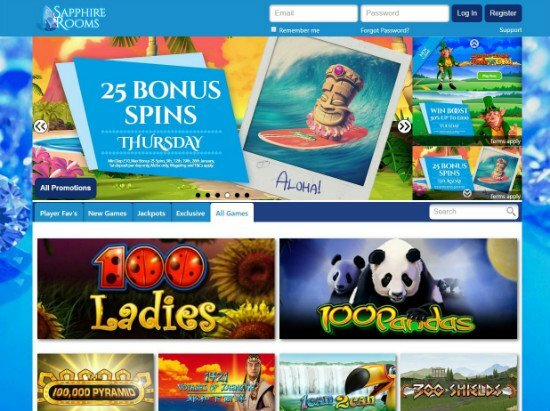 That's a pretty tidy sum with which to start your online gambling journey, all courtesy of the Sapphire Rooms bonus. Do bear in mind that in order to claim this bonus, you must meet the minimum wagering requirement of 30x the relevant value of the initial deposit plus the bonus amount. Existing players can take advantage numerous exciting and lucrative promotions that run on a regular basis, many of which are ongoing. The Win Boost bonus is one such promotion where players will receive a 50% boost on top of all your winnings for deposits made on a Tuesday. As all self-respecting online casinos know, it is important to acknowledge loyal players at the site. Sapphire Rooms does this by offering an exclusive VIP program that allows members access to tailored customer service, extra rewards and bonuses and plenty of other benefits that will enhance your online gambling experience. Sapphire Rooms offers three banking methods, which is much less then what we're used to seeing at an online casino. Regardless, players can make use of credit or debit card, Skrill and Paysafecard payments. While this can be restrictive, the addition of credit and debit cards makes it possible for most players to transact at this casino. Processing time vary by banking method and can take anywhere from 24 hours to five days to reflect. There is a minimum deposit amount of £5 and a maximum withdrawal limit of £10 000 per week, which is more than generous. Sapphire Rooms is also a shining example of how customer service should be done. The casino features an efficient and dedicated support team on call 24/7 to offer assistance and answer any casino-related questions you may have. The support team accepts live chat, email and telephonic enquiries. Sapphire Rooms Casino features a striking theme that shows off the casino's main features perfectly. The blue colour scheme matches well with the Sapphire theme of the casino, as well as giving the casino a safe, relaxing and welcoming look and feel. The homepage is laid out in a simple and user-friendly manner, so don't expect any flashy banners and bright Vegas-style effects. At Sapphire Rooms, simplicity is key. The games lobby is well represented on the homepage, along with a graphically-rich banner displaying the casino's latest features. Navigation is quick and easy, making Sapphire Rooms ideal for both new and experienced players alike. If you love slots, you will simply adore all that Sapphire Rooms has to offer. Here slots reign supreme, and while there are some table games to keep the die-hard fans happy, it is the slots collection that will leave a lasting impressive. There is a wealth of classic slots, new games and jackpots to choose from, all offering excellent graphics and sound effects, slick and sophisticated gameplay, unique and entertaining themes and plenty of opportunities to win big. If you have been searching for slots heaven, Sapphire Room Casino is what dreams are made of.